Phosphor makes for the development of a healthy, extensive root system and an exuberant flowering. Potassium prompts the flowering, the so-called flowering potency. The combination of these two components in a bio-mineral form can be rightfully called a superbloomer. Therefore, this is an essential component for every cultivation. In Bio Nova’s line of pure liquid mineral fertilizers (i.e. 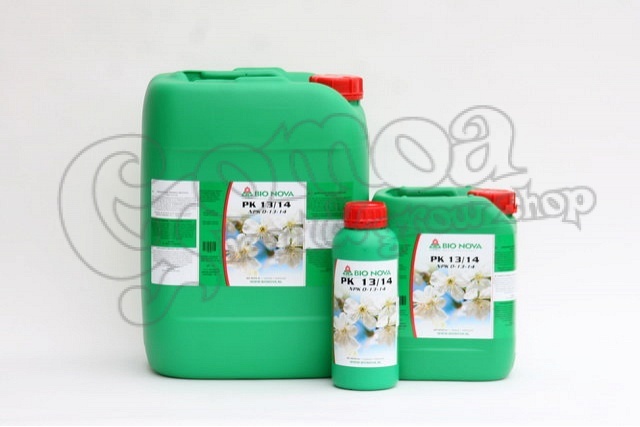 free of excess ingredients), Bio Nova has a very powerful and quick phosphor-potassium complex at her disposal called: PK 13-14, which is directly absorbable. This fertilizer should be used in combination with Hydro-SuperMix, Soil-SuperMix, LongFlower or NFT AQUA-SuperMix. A combination with one of these three, makes for a complete fertilization on hydro, soil or NFT-systems.